Posters are a popular part of the AWITC and are displayed throughout the conference. They provide an opportunity for researchers and students to report on ‘late-breaking’ work, for researchers to interact directly with delegates, and to show industry where research is heading. There will be around 180 posters on display in Foyer F, ground level of the Adelaide Convention Centre. The posters will be available for viewing at all times from Sunday morning (21 July) to Wednesday afternoon (24 July). Twelve of the poster abstracts will be selected for formal presentation within the ‘Fresh science’ sessions and student submissions will also be considered for the Student forum: In the wine light. 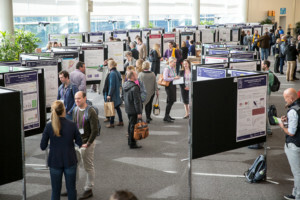 The Australian Wine Research Institute, Tasmanian Institute of Agriculture and Metabolomics Australia will award cash prizes for the best posters; AWITC is sponsoring a ‘people’s choice’ poster prize; and the Australian Society for Viticulture and Oenology will award cash prizes to the best two presenters in the Fresh science sessions. The winners will be announced on Wednesday, 24 July at the end of Session 10. Further information is available from the Poster Coordinators, Dr Mardi Longbottom and Dr Paul Grbin, at [email protected] or +61 (0)8 8313 6600.